The item Manga madness, David Okum, (ebook) represents a specific, individual, material embodiment of a distinct intellectual or artistic creation found in Charlotte Mecklenburg Library. 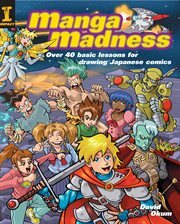 Draw awesome manga characters and scenes just like the pros!Capture the excitement of manga in your drawings! Inside you'll find hundreds of dynamic illustrations for achieving the hot, action-packed look you want. Loaded with detail and over 40 step-by-step lessons, you'll learn the skills and tips you need to create amazing characters and scenes.From drawing characters in cool poses to exploring visual storytelling, Manga Madness will show you the way!Drawing basics such as shading, perspective and foreshorteningJapanese terms, traditions and character typesQuick tips for having fun and improving your workFrom pretty girls and rebellious heroes to space pirates and giant robots, you'll get fast results for your best manga drawings yet!